Upgrading your X-Carve can be intimidating. Here are some frequently asked questions to help make your upgrade journey as smooth as possible! Upgrading your machine to 9mm belting is an easy way to increase reliability and performance of your X-Carve. Why should I upgrade my belts? Unlike 3D printers or laser engravers, CNC machines experience extreme cutting forces when in use. The cutting tool naturally pushes itself away from the material it's cutting. One important function of the belt on your X-Carve is to resist these cutting forces and keep the bit exactly where it is suppose to be. The stock X-Carve belts are 6 mm wide, and leave lots of room for improved cutting performance. The belting included in both of our 9 mm belt kits is significantly stonger than stock, and thus better at resisting the cutting forces that try to move the bit away from your cut. Stronger also means less likely to fail - and a failed belt during a project means damaged parts, broken bits, and more. Upgrading your belts to 9 mm is a great way to improve performance and peace of mind. What does 2GT2 and 3GT3 mean? The 'GT' system of designating belt size can be pretty confusing at first, but it's actually pretty straight forward. The number before 'GT' represents the 'pitch' of the belt, or how far apart the ridges are spaced. The number after 'GT' indicates the generation, or version of belt. The belts that come on the X-Carve are 2GT2 6mm belts. 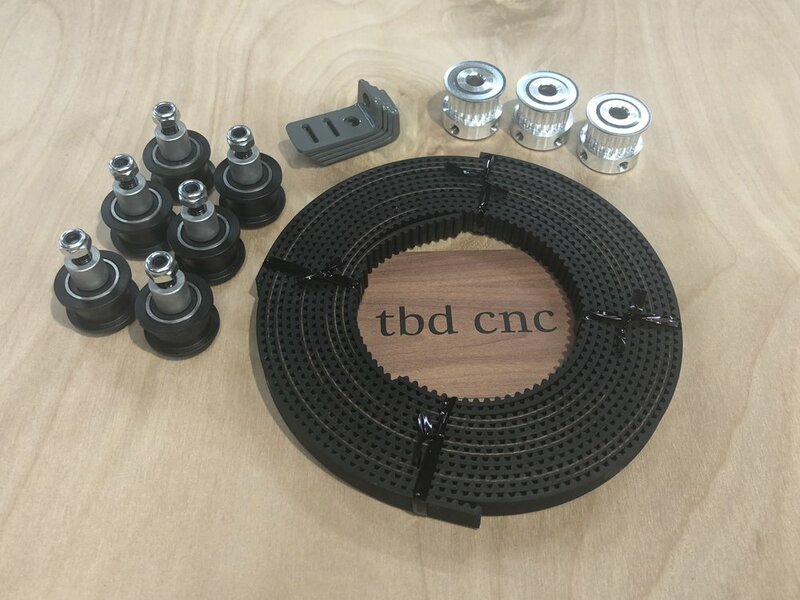 At tbd cnc, we offer 2 options to upgrade the stock belts - 2GT2 9mm and 3GT3 9mm. Both kits will provide significant performance improvements over the stock set. If you want the easiest installation possible, the 2GT2 kit is right for you. If you want the best performance possible, you should pick the 3GT3 kit. Please note that the pulleys attached to the motors on the X-Carve are only compatible with 2GT belts. In order to install the 3GT3 kit, the motor pulleys must be removed. Why aren't your belt clips black? Simple - the standard belt clips are black. We don't sell standard belt clips - we sell upgrades. We choose to make our own path rather than sticking with the status quo. Your competitor says they sell the strongest belt clips on the market. Is that true? Nope! tbd cnc belt clips have at least 25% more material at the weakest point than any other belt clip on the market. Also, our radiused inside corners eliminate pesky stress risers that can lead to eventual failure. 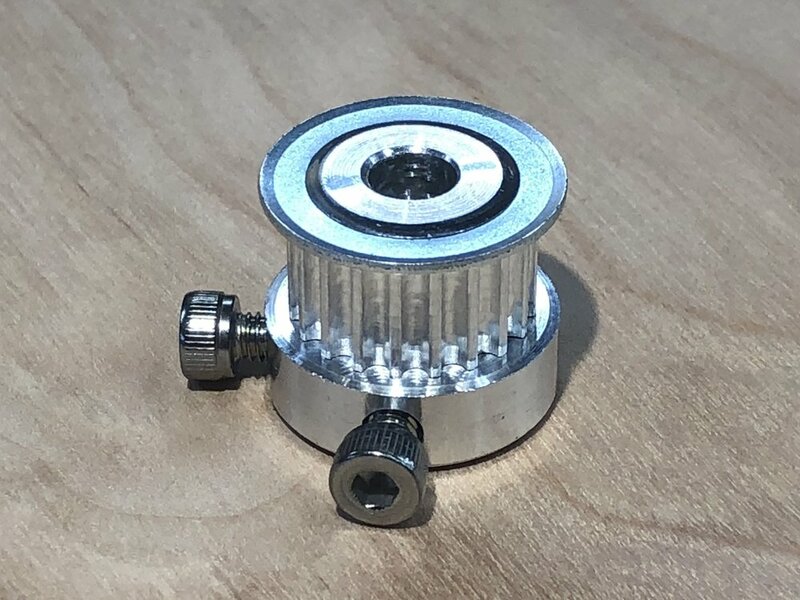 If I get the 3GT3 kit, how do I remove the motor pulleys? Use a rotary tool (think Dremel) with a cutoff wheel to carefully slit the stock pulley so that it can be easily removed. Use care not to cut into the shaft of the motor, although small marks will not impact performance of the new pulleys. Use heat. Carefully heat up the stock pulley and pull it off of the motor shaft. Use a gear puller. A gear puller is the perfect tool for this job. You're going to need a small one - try calling local automotive shops. Most will let you borrow the tool or even will give you a hand removing the pulleys. How long does it take to upgrade my belts? With either kit, the upgrade can be completed in a couple of hours. Why do the idlers and sprockets come pre-assembled? We pre-assemble sprockets and idlers so that we can make sure you don't have to deal with any surprises. We ensure that everything fits up correctly, and that the quality is up to our high standards. Additionally, the idlers have a small, internal spacer that is absolutely critical to a smooth operation. When you buy these parts from the big names, they just throw the spacer, bearings, nuts, and bolts in a bag and let you figure it out. We don't want you to have to deal with improperly installed spacers, so we take the guess work out and do it for you. Do I need to re-calibrate my machine after upgrading? Yes! Click here for instructions on re-calibrating your machine. Have you decided on a kit? Click below to jump to the one that's right for you. 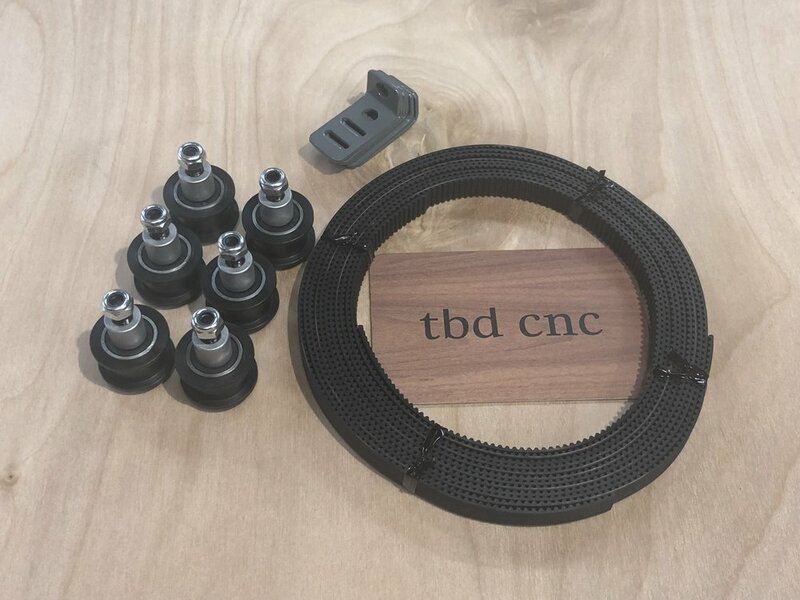 Why should I install tbd cnc risers on my machine? There are 3 reasons to install tbd cnc risers on your machine. You want more clearance to carve thicker materials. You want to increase the rigidity of your machine. Do I need to upgrade my Z-axis in order to use tbd cnc risers? Nope! Our risers will work for any machine, regardless of Z travel. However, we only recommend 2" risers if you are planning on upgrading your Z axis slider as well. 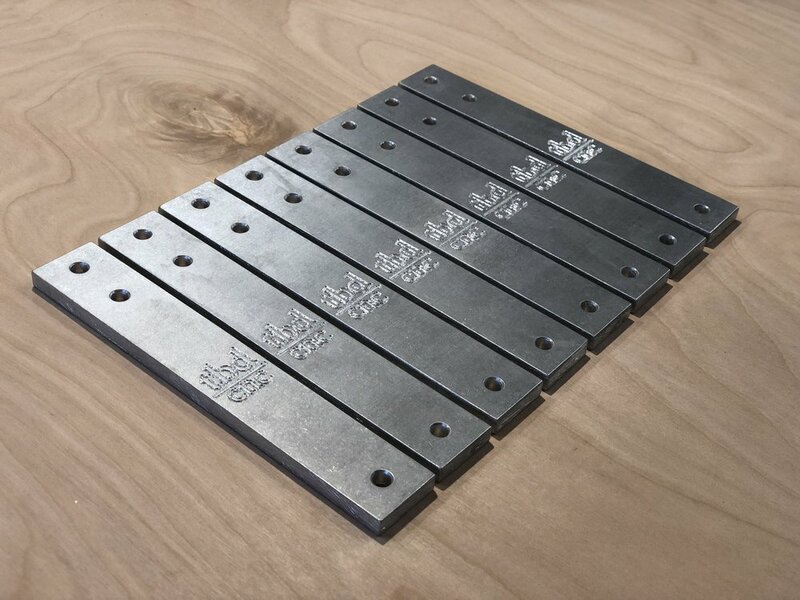 We offer stock, 1" , or 2" options for our risers. If you don't plan on upgrading your Z axis, choose either stock or 1". If you do plan on upgrading your Z axis, choose either 1" or 2". Feel free to contact us if you want help deciding. How long does it take to install new risers? Installing new risers is a quick process. Expect to be back up and running within an hour. Do I need to re-calibrate my machine after installing new risers? Nope! You only need to re-calibrate if you replace the belts. Why should I buy "Dustboot Clearance" risers? Dustboots are a must have to avoid a mess. Unfortunately, other commercial riser upgrades interfere with dustboots when the machine is in it's home position. tbd cnc Dustboot Clearance Risers are the only option for increasing the Z height of your machine without pesky dustboot interference. What Z axis slider should I buy? Check out our new Supergrade Z Axis! You won’t find a better slider for the X-Carve! Stiffeners are a great way to increase the overall rigidity of your machine. Why should I install stiffeners on my machine? 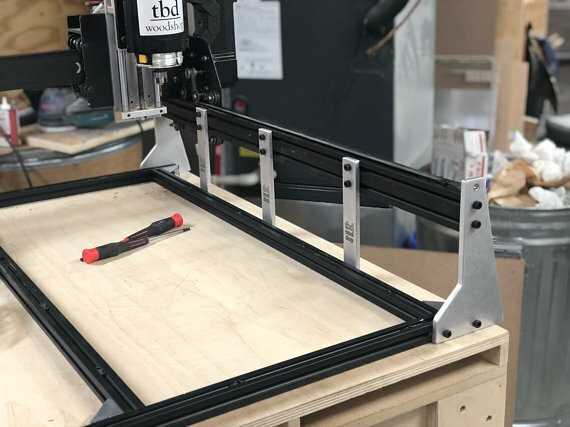 tbd cnc stiffeners are for those users that want the very best out of their X-Carve. Our stiffeners are made from 1/4" 6061 aluminum and will eliminate all flex from your Y axis maker slide rails. If you're trying to squeeze the most performance possible from your machine, our stiffeners are the way to go. Your stiffeners should match your risers. If you haven't upgraded your risers, pick stock stiffeners. Otherwise, just pick the same height you picked when your purchased your risers. How long does it take to install tbd cnc stiffeners? Stiffeners take some work to install. You will need to remove your waste board and gain access to the rails that run parallel to the y axis makerslide. You will also need to remove the risers from one side to insert the tee nuts and trim the waste board to fit. You should plan on dedicating some time to installing your stiffeners. It's a lot of work, but you won't regret it. What if I have Triquetra risers? Our stiffeners are fully compatible with Triquetra risers. Just be sure to pick the same height stiffeners as the risers you bought. What if I have Phantomm's screwdrive kit? Choose 'stock height' if you have Phantomm's screwdrive upgrade kit. We use USPS for all our shipments. Almost all orders will ship within 2 business days. Yes! We ship all over the world. Here is a map of the countries we have shipped to so far. We're expanding all the time!